Understandably, news of a solar powered touchscreen phone from Samsung was met with high levels of scepticism. But it’s not April Fools Day – it’s not even close, so why was my initial reaction that someone is yanking our chain? I’ll tell you why. It’s because, let’s face it, an energy efficient, solar powered touchscreen phone sounds just a little bit far fetched, don’t you think? But scepticism aside, it appears Samsung’s eco friendly phones, dubbed Blue Earth, is real and being green is at the top of its agenda. For a start, there will be no charging via an AC outlet for this bad boy, oh no. Just like the process of photosynthesis, this phone requires sunlight via the solar panels on the back. And apparently, it’ll generate enough juice to call anytime anywhere – which is an ambiguous statement to say the least! Is this after only a few hours of sunlight exposure, or days? 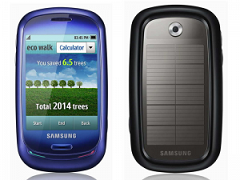 The handset itself has been constructed from recycled plastic bottles (much like the MOTO W233) and comes bundled with an ‘Eco Walk’ facility, complete with pedometer, to encourage you to get your walk on and consider your effect on the environment by calculating how much C02 could have been used had you jumped ion your gas guzzling automobile. It’s other green credentials include screen brightness control, backlight duration and Bluetooth, using an energy efficient mode. There’s no word, on pricing, availability or whether this is some kind of joke. If this is a joke, it’s not a very good one. The fact that the phone hardware would be exposed to heat [from the sunlight] could be a serious problem, but I suppose it could function. Photosynthesis!? That’s not how solar cells produce electricity!